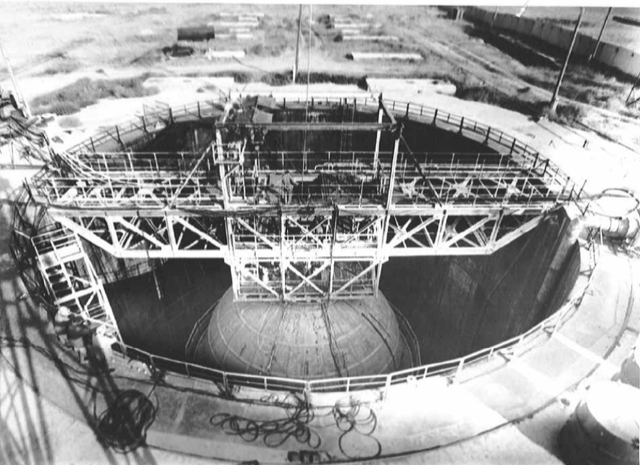 In the early 1980s, US Air Force intelligence observed another sphere being built at the Sevmash shipyard, Severodvinsk. From here the sphere was transported from the Arctic across the White Sea and down the Volga canal system to the Russian town of Kharabali. An object this size being moved to a nuclear test site attracted a great deal of attention in the classified intelligence community. From Kharabali, it was trucked approximately 100 km overland to the small Azgir test site. Azgir, formally known as Galit, was already of considerable interest to Western intelligence agencies. This is because the area is located above salt bed formations where Soviet engineers had detonated nuclear explosions. Inside the large underground cavities, other nuclear explosive devices could also be detonated although when detonated inside a cavity, the seismic signal is decreased. This is known as decoupling since detonating the explosive in a large void ‘decouples’ the blast from the earth to lower the yield signature. During the Cold War the possibility of decoupling was a serious intelligence concern, since it could enable a party to get around test ban treaty thresholds by masking the actual yield. Decoupling can work in any kind of cavity, such as a mined room, but the salt cavities were convenient for these experiments. 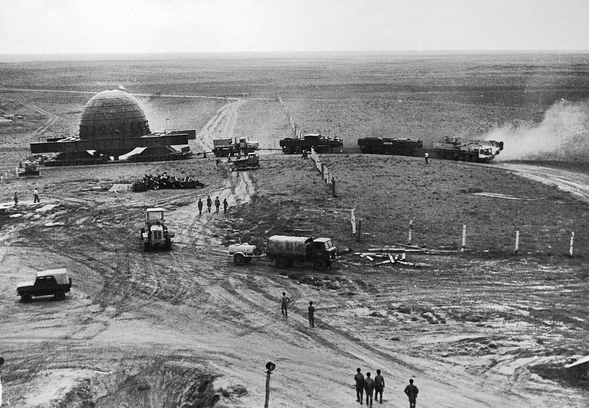 Given that the sphere was being placed in a nuclear weapons test site, it was logical to believe that it could be a container for nuclear explosions, such as for DEW. Alternative uses, however, could be for improved diagnostics under controlled conditions or, seeing that containers also allow you to recover debris and analyse what you make, could have industrial uses such as nano-diamond production. The Soviet Union also experimented with the idea of producing electricity by detonating small contained nuclear explosions repetitively and using the heat produced to make steam and drive turbines. The US also briefly considered similar schemes, such as the Pacer programme, which was designed to heat up the ground so circulated water could turn to steam and run turbines. The Azgir sphere is massive and heavy. With a 12-metre diameter and walls 100 mm thick it was designed to contain a high explosive yield of up to one tonne. 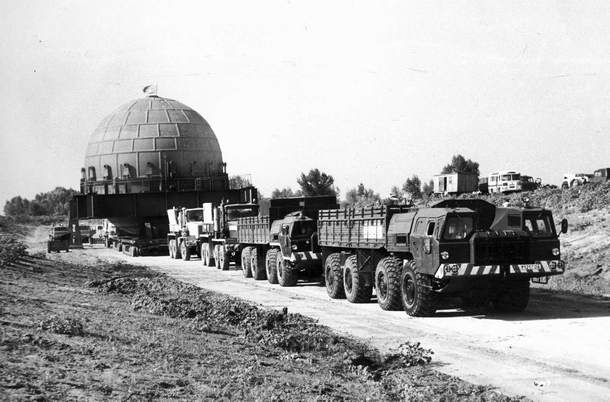 With a volume of 905 m3, the sphere is of a considerable size and according to the VNIIEF website, the Azgir sphere and its supporting mechanism weighed 700 tonnes. It was finally commissioned in 1986, after Keegan’s retirement from the US Air Force, and used until about 1991. 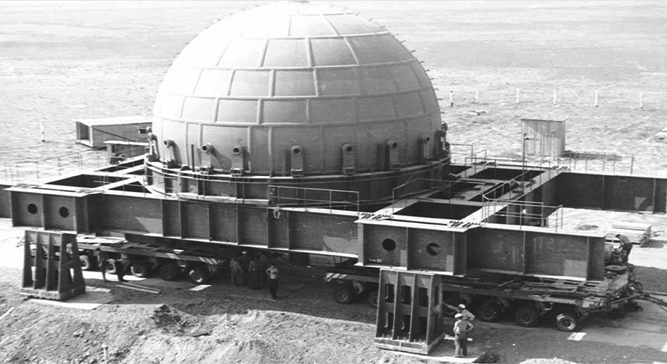 As of mid-2014, the VNIIEF clearly specifies that the sphere was a test device for containment studies and that it was used to produce diamonds by explosive compaction. The site is called Yava-1M (sometimes written Java), alternatively 13YA. Israeli firms have a commercial interest in recent Kazakh plans to produce industrial grade diamonds. According to the Israeli Diamond Industry trade group, the sphere (without the supporting mechanism) weighs 450 tonnes and is emplaced in a pit 24 m in diameter and 24 m deep. 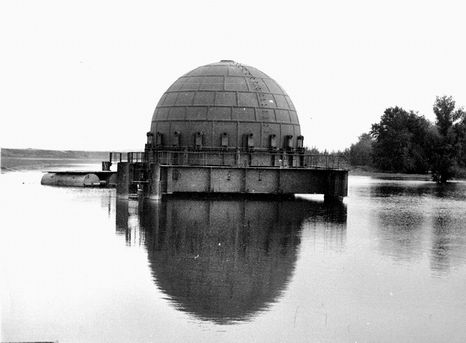 Once the sphere was emplaced a bridge structure, still visible in satellite imagery, was built over it. 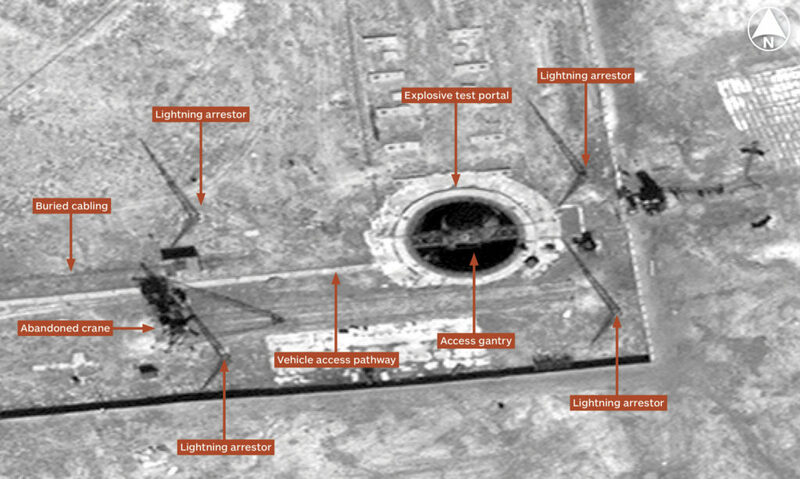 The pit with the sphere emplaced at Azgir is clearly visible in this satellite image. PART FOUR: Misunderstandings and the US experience will be published on 13 July 2018.